On 12th October 2002, terrorists launched devastating bomb attacks in Bali, Indonesia, resulting in the death of 202 people, and generating large numbers of injured people, many with severe burns, and blast and shrapnel injuries. The attacks involved the detonation of three IEDs: a backpack-mounted device carried by a suicide bomber; a large VBIED, both of which were detonated in or near popular nightclubs in Kuta; and a third much smaller device detonated outside the U.S. consulate in Denpasar. Damage to the densely populated residential and commercial district was immense, destroying neighbouring buildings and shattering windows several blocks away. The car bomb explosion left a one meter deep crater. The local Sanglah hospital was ill-equipped to deal with the scale of the disaster and was overwhelmed with the number of injured, particularly burn victims. There were so many people injured by the explosion that some of the injured had to be placed in hotel pools near the explosion site to treat their burns. Various members of Jemaah Islamiyah, a violent terrorist group with links to al-Qaeda, were convicted in relation to the bombings, including three terrorists who were sentenced to death. The impact of the Bali bombings on the Indonesian economy was devastating. In 2001, Bali generated more than 25 per cent of Indonesia’s foreign exchange earnings, and Bali’s economy accounted for 1.3 per cent of the national economy. Following the bombing on 12th October 2002, after which many countries issued warnings to citizens planning to travel to Bali, the number of foreign tourists visiting the island declined by 57 per cent. Two weeks after the bombing, 2.7 million tourism workers were unemployed. 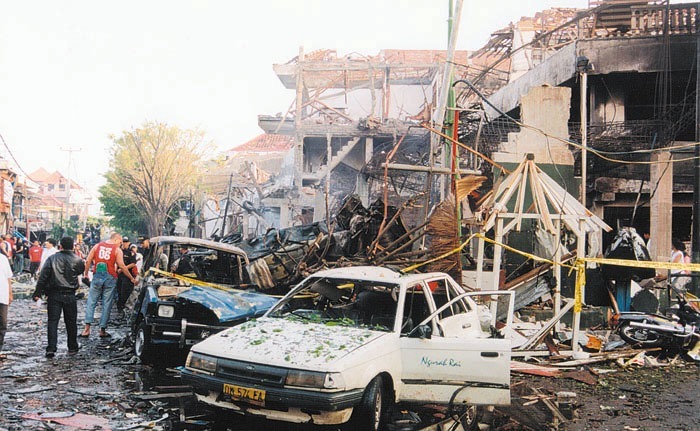 Three years later, on the evening of 1st October 2005, suicide bombers struck again in Bali. One blast struck a crowded main square at central Kuta. Another two bombs exploded at Jimbaran beach, one of which was near the Four Seasons Hotel. ”The ground was just covered in blood. People were walking around with arms missing. I tried to run but I kept falling over. Then the second blast happened. People were in panic. I just tried to save myself.” said an eyewitness. The death toll was 26 and 130 people were injured. Police later found three unexploded bombs in Jimbaran. They failed to go off after the security forces hastily shut down the island’s mobile telephone network following the first blasts.